This dense, moist banana bread is full of plump, tangy raspberries (you can use fresh or frozen!). A bit of whole wheat flour makes this the perfect hearty breakfast or snack! Hi, hi. Happy hump day. I’m having a crazy busy week that I’ll fill you all in on soon. For now, let’s talk banana bread. Is it possible to have too many banana bread recipes? I don’t think it is. My problem with banana bread is that I never have enough brown bananas. No matter how many yellow bananas I buy, they always seem to get eaten before they get a chance to turn nice and brown. Lately it’s been even worse because the worms in our aquaponics system eat bananas, so if hubby isn’t eating the fresh bananas himself, he’s feeding them to the worms. Kinda gross, huh? Who talks about worms on a food blog!? Whoops. Anywho, I bought a giant, massive bunch of bananas and finally had a few go brown. We’ve been buying lots of strawberries from the local strawberry stand. They are seriously amazing. And even though the smallest batch you can buy is 3 big, overflowing baskets, they still disappear in a matter of hours. They’re just so fresh and yummy. Nothing like the flavorless strawberries you get at the grocery store. I bought some strawberries with the intention of making one of our favorites– some Strawberry Banana Bread. But the strawberries were long gone before I got to baking, so instead I used some raspberries I had gotten on sale. It ended up being a fun way to change it up. The juicy raspberries made the banana bread a little more dense than the strawberry version, but more dense = more moist, and when it comes to banana bread, moist is definitely a good thing! Mash bananas with a potato masher or fork. In a large bowl, mix butter into the mashed banana. Mix in the sugars, egg, and vanilla. Sprinkle the baking soda and salt over the mixture and mix in. Add the flours and mix to combine. Gently fold in the raspberries. This banana bread is hearty enough for breakfast or a snack, or sweet enough for dessert. It didn’t last long– banana bread never does! Check out these other delicious banana bread recipes! What’s your favorite kind of banana bread? Do you like to keep it classic or fill it with lots of fun add-ins? 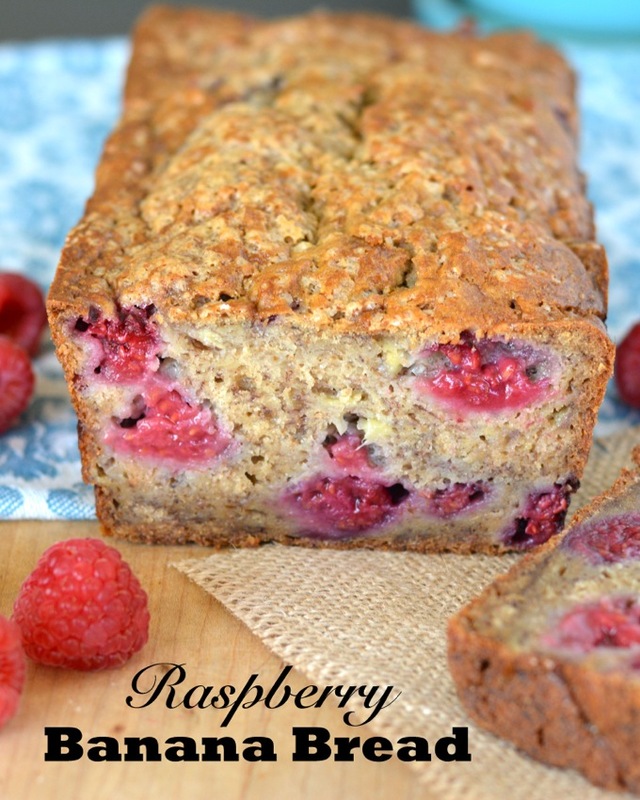 Your Raspberry Banana bread is looking so very yummy! I usually add chopped Walnuts to my banana bread. When I make my strawberry banana bread, I add 1/3 cup of orange marmalade to the mix and it is a nice touch without being tart or overpowering. I love banana bread, and it’s fun changing it up by adding different mix-ins! The raspberries here look SO good! Pinned. Oh what a pretty bread, Jess! i can never resist banana bread, it’s my kryptonite! I’m loving that you added raspberries to this. Sounds fantastic! I never seem to have enough brown bananas either! I usually have to plan a week ahead, but extra bananas, and then put them in the back of the cupboard. As soon as I can smell them, they’re ready! Haha! 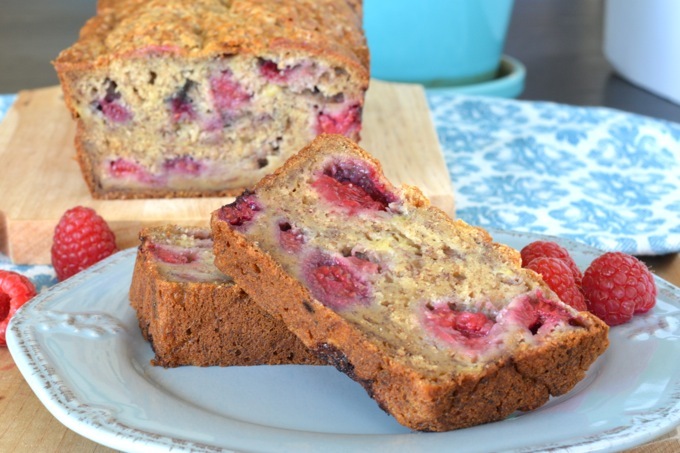 Love all those raspberries in your banana bread. Yum! That’s a good idea– I need to start hiding the bananas! HAHA! Oooh! 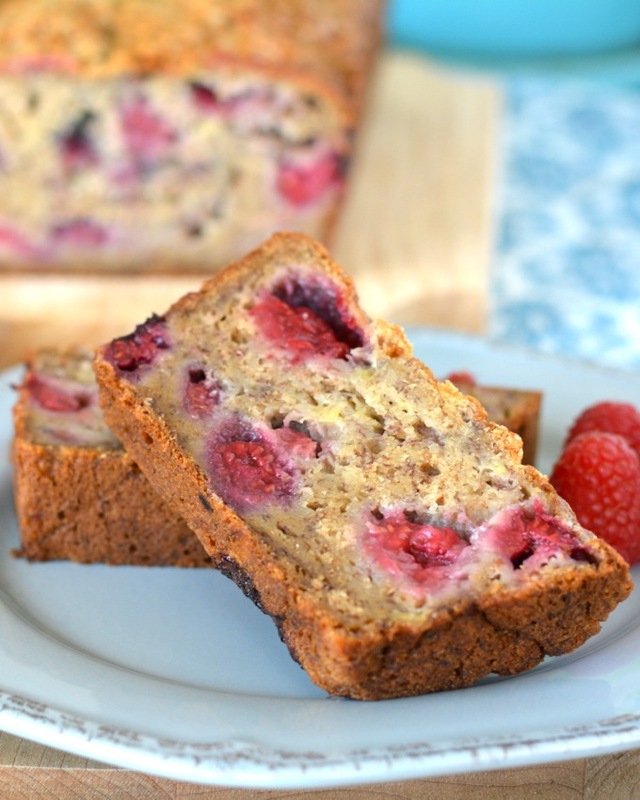 I’ve been on such a berry kick lately, and this raspberry banana bread looks amazing! I haven’t made banana bread in awhile, simply because I have the same problem you do… I can never get them to the banana-bread stage without eating them all. Lol! I’ll have to make this soon! I guess we never really have brown bananas here either, since my 1 year old is a banana maniac! This looks delicious, Jess, love those raspberries in there! I agree, there is never enough banana bread recipes! I have the opposite problem, I seem to buy so many bananas and I always have a few that go a little too brown before I can get to them. Good thing I love banana bread! The addition of the raspberries is so great! Yes!! There are never too many brown bananas, LOL! I’ve been wanting banana bread lately! Love the raspberries in this recipe!